Today was a big deal for comic book fans everywhere as it was the start of DC Comics New 52. For those of you not in the comic book know (which I’m assuming is just about all of you 🙂 DC Comics is what you call a “big dog” when it comes to comic books. They publish many of the big name titles like, Superman, Batman, Green Lantern, Justice League of America, The Flash, and many more, and starting this month they are starting all of their 52 titles over…from the beginning….as in issue number 1. This may not sound like a big deal to you, but it’s never been done before in the history of comic books. Ever. One reason they are doing this is because comic book story lines have been going on for decades, which makes it hard for today’s teenagers to get into them. There’s to much of a back story to catch up on. So they are taking a gamble and rebooting their entire line up, and starting their story lines over, in hopes of attracting lots of new readers. 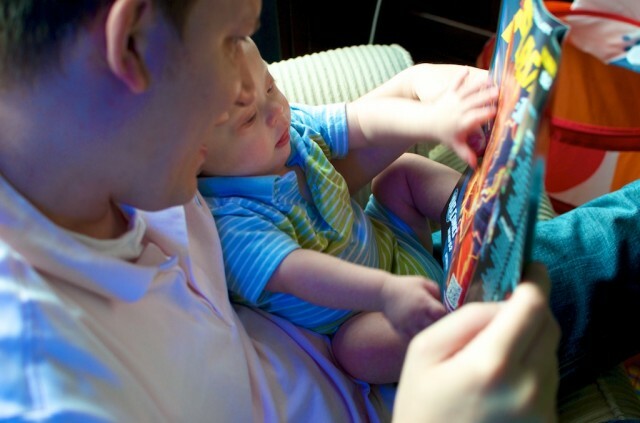 Here’s one of their first new readers, my son. Baby Noah. 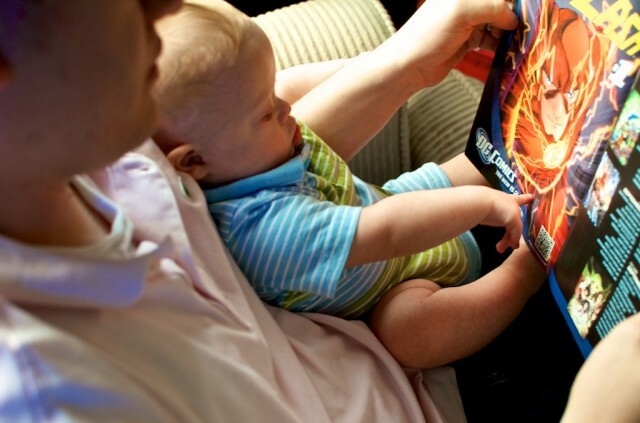 DC Comics, meet your newest fan. I’ve always been a fan of comic books and have been looking forward to the launch of the New 52 since I first heard about it. 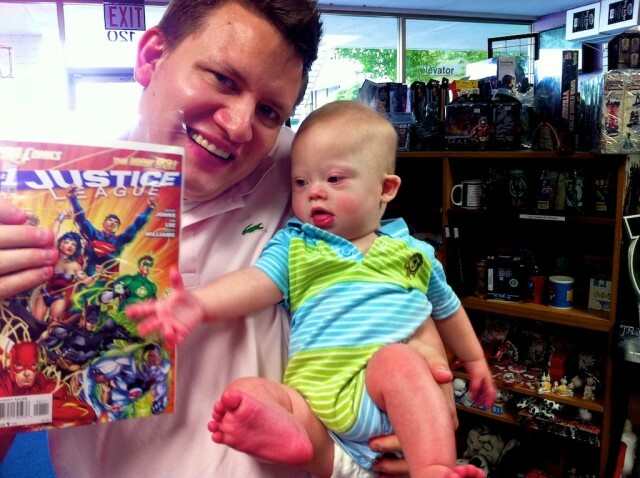 I was especially excited to introduce Noah to one of my favorite super heroes (Superman) with issue number 1, and for all the monthly trips we would surely make to the comic book store to pick up the latest issue.! It’d be a fun father and son tradition! I think he's already a fan. Sadly, my father and I didn’t have any traditions. I have no memories of my father ever telling me a bedtime story, praying with me, or reading the Bible to me. I’m not really sure why he never did those things, because he missed out on one of parenting’s greatest gifts; pouring into your kids. I want to be a different kind of dad. I want to pour into my child. I want to have lots of fun traditions. I want to pray over him every day. I want to teach him something new and exciting about God every day. I want to have the kind of relationship with my son that my dad never had with me. I love being this little boys dad! The great thing about starting a fun, new tradition is…it’s easy! It’s never happened before, so essentially you could make anything you wanted into a tradition. 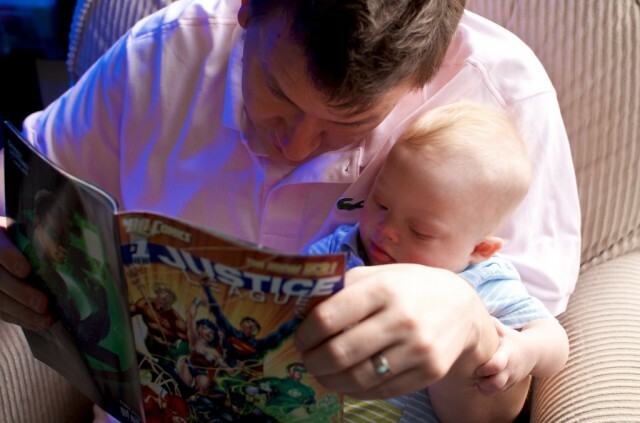 Since this was the fist time comic books have ever started over, I thought comic books would make for a perfect father and son tradition! I have this idea in my mind of picking up Noah from school when he’s in the 3rd grade, and heading down to the local comic book shop to pick up the latest Superman comic so that we can go home and read it together. On road trips we can talk about what our favorite issue was, what our favorite superman super power is, and what we think will happen in future issues. Looking forward to lots more of these trips! Of course it may not happen just like the image in my head. (When it comes to parenting, I don’t think anything does.) 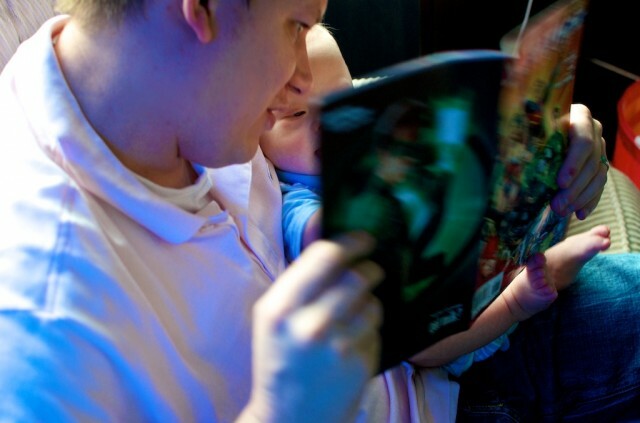 Noah may grow up liking Batman more than Superman, or not liking comic books at all (shudder!) That’s ok. We’ll do something different. We’ll start a different tradition. I’ll find a different way to create fun experiences that we can share. It’s not about the comic book. It’s about the experience. Parents, never forget that when it comes to your children, it’s always about the experience, and those experiences can often turn into traditions. It’s never about the item, the vacation, the money, or the stuff. It’s always about the experience. Always. I love spending time with this little boy. One of the greatest gifts you can give your children is a lifetime of wonderful, loving, experiences with their parents. Depending on your child’s age it may seem that that’s not what they want…but it is. Your children aren’t yours. They are God’s. He has loaned them to you, and you won’t have them forever. Make sure to keep the main thing the main thing, and daily look for ways to give your kids experiences. Experiences are cheap, anyone can afford them. (Superman comics cost 2.99 cents a month.) They can even be free. You can go on a weekly walk with your child and talk to them about their week. You could have a Friday-night-camp-out-in-the-living-room-night. You could take your son or daughter to McDonalds for a 99 cent ice cream cone on Fridays. Be creative. You’re the parent. It’s up to you to do this. I hope you will. Comic book traditions are especially fun! If you’re a Christian I hope that prayer is already a tradition in your house. I hope you are daily taking your child in your arms and praying for them. Thanking God for them. Asking God to protect them. For their lives to reflect our great God for a lifetime. This is perhaps the most important tradition a family could ever have. This comes before Superman comics, walks, ice cream cones, and living room camp outs. It’s the tradition that can have the greatest impact on the life of your family. I’ve worked with teenagers for over a decade, and I can tell you that there aren’t many fathers doing this. 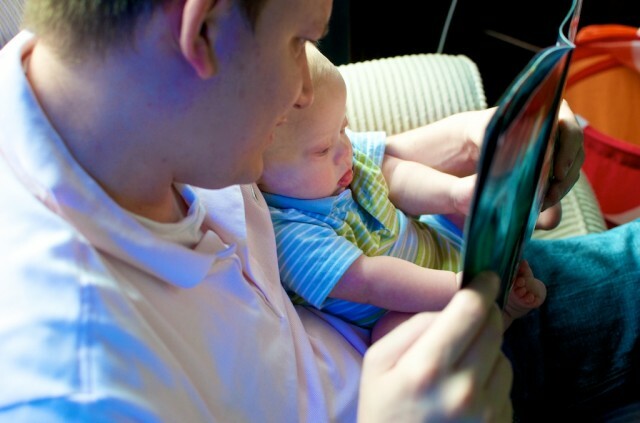 Fathers today are often harsh, angry, busy, mad, overworked, underpaid, and stressed. They spend more time trying to grow their business, than growing in their relationship with God. This is sad. If you aren’t taking time to grow in your relationship with the Lord each day, you’re going to have a hard time leading your children in the way of God. I assure you. If you want to be the kind of dad that turns their children into world changers, you are going to have to cultivate your relationship with God. If you need help with this, please contact me. I’m growing in this area just like you, but I can suggest some good books, or tools to help you in this area. I don’t recall my dad every praying or reading the Bible with me. Ever. I was short-changed by my dad. He was supposed to “lead me in the way of God.” Sadly, he didn’t. Thankfully, the Lord put other men into my life that did what my dad should have. And while I praise God for those men, my heart still hurts that those men weren’t my dad. My dad passed away several years ago, and in a way we both lost. He’ll never have another chance to do what God had called him to do, and I’ll never have one memory of my dad praying with me, or reading the Bible to me. Ever. You still have time to do what you’re supposed to do. It doesn’t matter how old your child is, or how long you haven’t done this. Start today! Make today the day you start praying with your children. The day that you start reading the Bible to them. The day that you start teaching them the way of God. Remember, you are a superhero to your son or daughter…! Dads are super heroes to their kids! As dads we often think we have to be the tough guy all the time. The guy who can fix anything (I’m actually ready to give up this role!). The guy who never cries. Blah, blah, blah. Don’t believe this garbage…! The mostly manly man is the dad who gets on his knees with his son or daughter and prays. Who can say he doesn’t know it all, but He knows the One who does. A dad who holds a high regard for God, for pray, and for The Bible. This is the sort of dad that wins with his kids! Dads, I urge you to not let another day go by without taking time to pray for / with you child, and to teach them about God. This may mean you have to start praying and reading the Bible yourself. It may mean you need to start getting up a little earlier (or staying up a little later) so that you can make time for your own personal growth. It may even require you to say “I’m sorry” to your children for not being the dad you were called to be. But it’s worth it. It’s so, so worth it. Don’t let another dad be the dad you should have been! What sort of traditions do you have your kids? If you don’t have one that’s ok. What’s a tradition you’d like to start but never have; today’s a great day to start it! I think you’re doing a great parent’s job with your lovely son Noah. Thanks for sharing the videos and thoughts. Thanks you very much for the kind words. God is way to good to us. It’s amazing how our children change our lives and our perspective. As much of a blessing that Noah is to you, you are also a blessing to him. Your words are also very inspiring and I’m sure they have touched more than one other dad already. Thanks for the kind words. As I mentioned above, I owe every once of who I am to the greatness of God. The Lord has been so graceful to me, and I want to live my life to extend that same grace to others, especially my son and my wife. Parenting is one of the greatest privileges (and responsibilities) we will ever have, and it breaks my heart when I see parents being a poor steward with what God has entrusted them with. People belong to God, us. They are entrust to us for a little while. And as parents we will have to answer to God one day on how we did with taking care of His “stuff.” With a great concern on if we taught our children CORRECTLY about God. I shudder to think of what that account will be like for many parents. By God’s grace may we parents that will hear “well done” when our time comes. I loved reading this post. I think it’s fabulous that you are following the will of God and telling fathers to man up. I am currently a female college student, but this post helped me to think of the kind of Godly husband I would want one day and how I would want to raise a child. Kudos to you for stnding up for God and not letting anything else stand in your way. Thank you for your kinds words, I really appreciate them. God has been to kind to our family. The grace He has extended to us, and specifically in regard to allowing me to the place in life where I am not, is overwhelming. I’m thankful that you have decided to marry a man who is committed to the Lord. Never forget that commitment. I can say from experience that there is nothing that compares to be being married to a spouse that loves the Lord. The world has nothing that even comes close. Also, there are fewer things that are megaphones of God’s goodness to the world than a Godly marriage. They are far and few between these days, which increases their value. My wife and I just celebrated 4 years of marriage, and 7 years of dating before that! (I had a lot of growing up to do. 🙂 The world may try to tell you there’s no benefit in handling relationship and marriages the right way (God’s way) but don’t listen to them. They say that because they have never experienced a true, Chris-like relationship. may i know about his heart. Is there anything wrong with his heart because my baby also got heart problem but only 4mm. so on 1st january 2012 his has to do echo. I hope that problem gone already. Greetings from Venezuela. I made a video to wish Merry Christmas and included two photos are here. I hope you like. An excellent blog. I’m a fan of DC Comics superheroes and they have taught me much to be better every day. Merry Christmas to all your family. What is your favorite DC comic book? Hi! We have lots of great traditions with our daughter Julia, such as reading The Bear Snores On every night. I also sing to her at night the song that my grandfather (!) sang to me, in Hungarian, when I was a little girl. Most special to me, though, is running. I ran throughout my pregnancy with Jules and would post on FB about the races with finished together. Now, when I run (she’s only 15 months old and also has DS, so it will be a while before she joins in), she gets all of my medals. 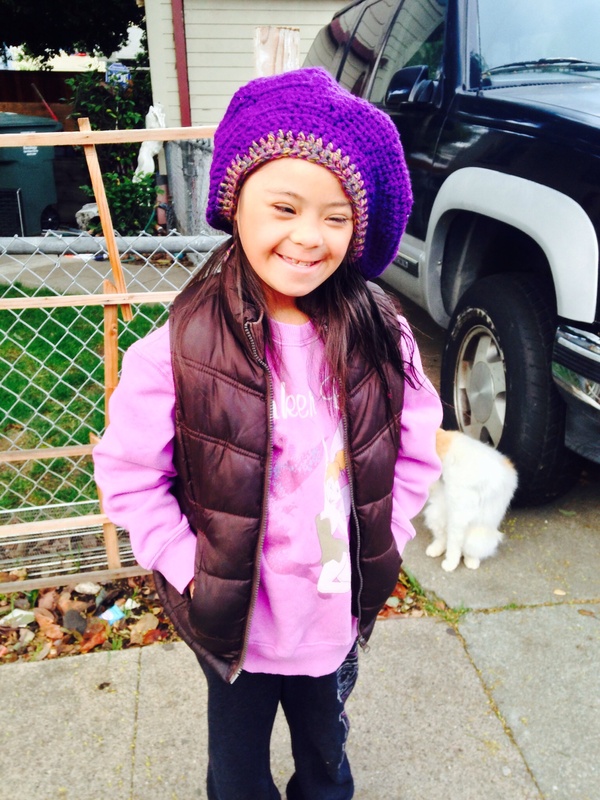 My hope is that she will eventually run with me so that we have a special time to talk and connect. As for my husband, he reads her zombie comics! To each his/her own!! I love this….my son is with God now, and as hard as it is to not have him here, we need to remember that our children are only loaned to us. We were so blessed to have him here for 15 amazing months, and we’re so honored to have been chosen to be his parents during this short time. Thank you for this reminder! I really needed that today. And thank you for sending out such a positive message! Thanks for telling us about the new launch; I did not know they were starting over, how exciting for kids these days! My son is really into superheroes and now I know what our new tradition is going to be every month because I love superheroes too and I’m the mom! What a wonderful message! 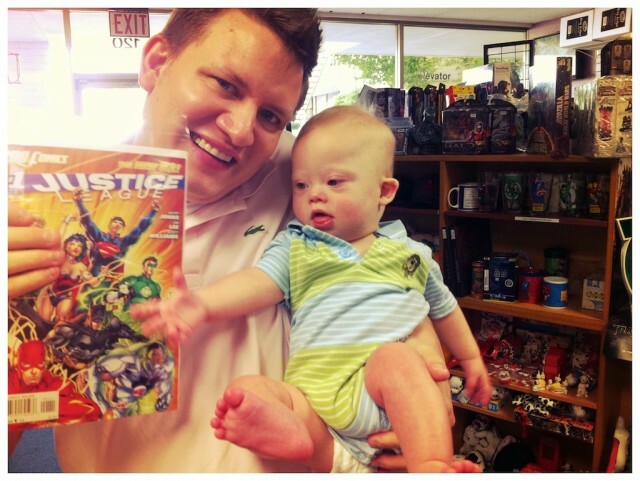 If I were a betting person, I’d bet that Noah will be a Superman fan just because it is something you shared with him. A note to grandparents- Sometimes we have to fill in because our children aren’t doing this. I’m blessed with 3 granddaughters who love to come and visit because bed time is the time for a story, talking to Jesus, and then reading out of the Bible. All three asked for their own Bibles before they turned 6!